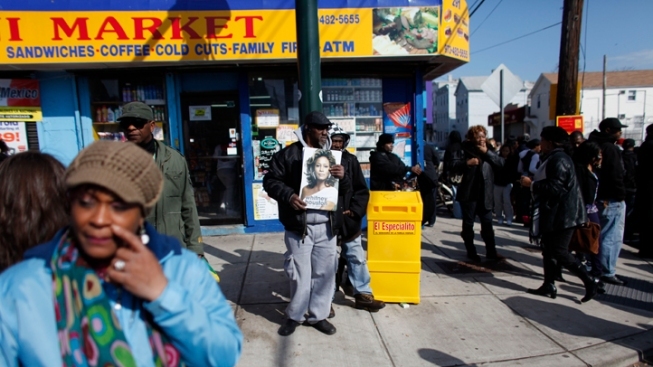 Whitney Houston fans gather a few blocks from the New Hope Baptist Church before the singer's funeral in Newark, N.J., Saturday. 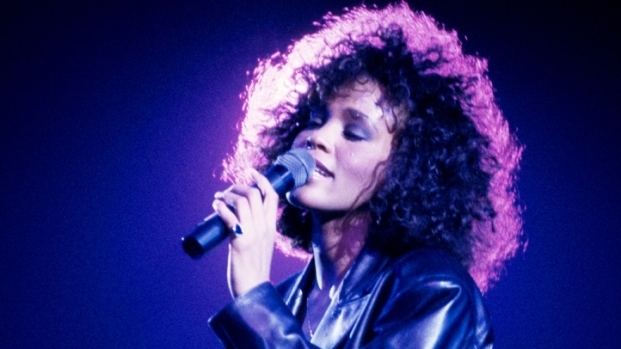 While Whitney Houston was being mourned Saturday at her funeral at her childhood church, just blocks away, her music lived on. One fan stood in the middle of a street, wearing all black and playing the saxophone to the tune of the pop icon's "I Will Always Love You." Others sang along, some filmed the performance, and still more watched from the second floor of an apartment building. Even the police officer who was blocking fans from getting closer to the church grooved along to the performance and shook the saxophonist's hand afterward. "A lot of hearts are broken now," said the saxophonist, Leriandre Silva, who is from Brazil and lives in Boston. Silva received a standing ovation after performing several songs, including Houston's "I Have Nothing." Others gave him hugs. Houston died Feb. 11 in California the day before the Grammy awards. She was 48. A cause of death hasn't been determined. About 100 people crowded together at Jay and Sussex streets about three blocks from the church, a rundown enclave in urban Newark. Some craned their necks in hopes of getting a glimpse of the mourners, perhaps a celebrity. A radio played a live broadcast from the funeral, while a few of the more entrepreneurial among the crowd sold T-shirts with Houston's image and photos of her. The scene had much in common with the private funeral nearby: crowds singing and celebrating life, stopping to mourn as well. The group lacked the star power of the funeral, where Stevie Wonder and Alicia Keys performed, among others, but those gathered were just as determined to remember Houston. One couple drove more than 150 miles from Providence, R.I., singing Houston's songs along the way. They hoped to find some closure. "Even though it's somber, it's something we had to do," said Stacey Walden, who came with her boyfriend. Another woman, Michelle Johnson, 54, said she was watching news coverage of Houston's death at her home about 20 minutes away in Oldbridge. She said the death of her mother two years ago helped her related to the loss Houston's family felt, and compelled her to make the trip. "I just wanted to come today and share all of this with everybody in this community," she said. "She's resting now." Johnson also said she wasn't upset that she couldn't get close to the church. "It's fine for me being right here," she said. "I feel like I can just touch her. I'm happy."